Forum Übersicht - Modifikationen » CREE reverse light bulbs? With the tinted windows, visibility out the back isn't great at night due to the poor light given out by the reverse lamp bulbs. Obviously CREE bulbs are going to be better but which type? Anyone tried any of these? Any opinions? Photos would be great too, if you have any. 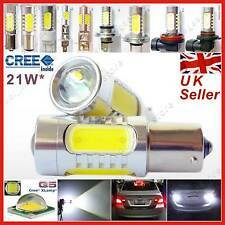 RE: CREE reverse light bulbs? yes I ve seen them as I went by ebay UK. first of all they are pretty expensive, not even including postage and handling to Germany. How long do you have to leave it in reverse for them to melt the plastic???? CREE's let off much less heat, so should be ok.
well they were on for about 15 minutes or so. I know, but who things of the heat? but it would be nice of you letting us know how it went out. But thats what Im saying, first try the ones with the most power. If they dont work out, due to lets say insufficient light patters, take the next. But keep an eye on your cost buddy. Not expensive and look very bright!. He claims the beam reaches 20-30 meters! Looks to me as if they light the driveway for 5m and then nothing. OK they are very bright, but you have to take a look if they suit you. Are useless/no good in the Kuga lamps, due to the bulb going into the lamp at an angle and not facing directly back. Fitted them to a friends car where the bulbs point straight out the light and they work well. Think I may have to try the ones in the first picture! Hope they work, as they will be a good waste of £30 otherwise. thanks for your information. Dont waist too much $ just for better bulbs. As I told ya, we use 35 watt regular bulbs and thy work fine.